At the Esther Raab Holocaust Museum and Goodwin Education Center, we are dedicated to teaching about the Holocaust, preserving the experiences of those who survived, and honoring the memory of those who perished. According to statistics from the FBI, NJ is home to the 2nd highest number of hate crimes in the country. Teaching the lessons of the Holocaust is an important and effective means to reduce prejudice, and affect attitudes to lessen hatred, bigotry, and violence against all groups. We hope that our programs will become an essential part of your "Character Education and Anti-Bullying Curriculums." Please contact Helen Kirschbaum to schedule a trip to the museum, a survivor to speak at your school, or for any other information. The Raab/Goodwin Center is proud to partner with the New Jersey Commission on Holocaust Education to offer some exciting video conferences, giving students the opportunity to meet with eye-witnesses to history. Video Conferences available on request, please contact Helen Kirschbaum at hkirschbaum@jfedsnj.org for more information. This program is appropriate for students in grades K-5. The story recounts the remarkable events of the 1993 holiday season in Billings, Montana. A hate group harasses Jewish families and other groups, so residents band together to resist the forces of bigotry that threaten their community. The story is based on Janice Cohn's book The Christmas Menorahs: How a Town Fought Hate. It is designed to help young children realize that individuals can find things to do to work against hatred and make changes in their community. See the world of Anne Frank “Through the Eyes of a Friend.” Witness the pain, loss, and hope of young people during the Holocaust. This moving program is a poignant portrait of friendship and survival, brought to life through the eyes of Anne. Join us for this special multi-media production followed by a panel presentation by local Holocaust Survivors. The performance lasts approximately 30 minutes and is followed by 20-30 minutes of questions. It is age appropriate for students grades 6-10. This play was inspired by letters from students, written by author and playwright, Richard Rashke, Dear Esther tells the story of Esther Raab’s Escape from Sobibor. The play illustrates her commitment to learning the lessons of the past and the effects of bigotry, prejudice, and hatred and proves that the events and lessons of the Holocaust should not be forgotten.The play is about 1½ hours long and is followed by a member of Esther Raab’s family taking questions from the students. 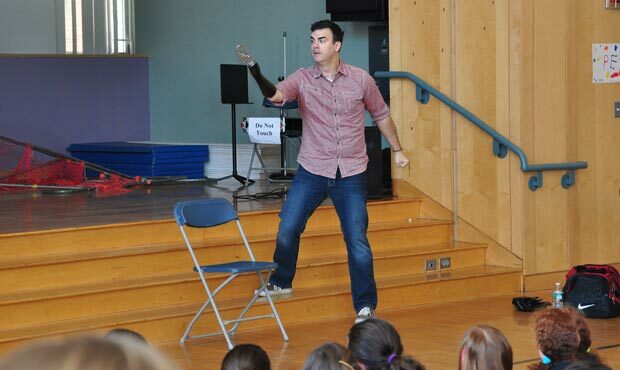 In The Boy Who Could Be Captain Hook, a moving and humorous look at growing up without a right hand, actor David Harrell relates how he wanted to be a part of the normal playground games, but was only included as the other kids recognized his prosthetic hook as being perfect for portraying Captain Hook in Peter Pan. Always wanting more, David clearly demonstrates that by not judging a book by its cover, everybody grows. The Boy Who Would be Captain Hook program serves as an excellent vehicle for character development curriculum.